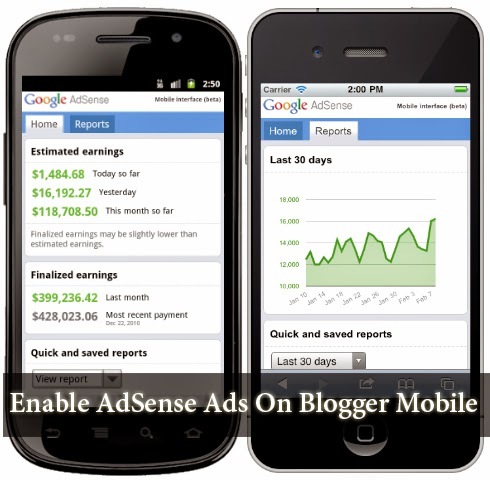 How To Show AdSense Ads On Blogger Mobile? Bloggers will go to great lengths to optimize AdSense ads on their websites, but many focus their attention to desktop version of Blogger, mostly because it is easier to test and preview changes. However, they are missing on an ever-growing percentage of users who surf the web with their smartphones - and currently at around 25% (both mobile and tablet), the percentage is significant. If you're a Blogger user, now would be a great time to enable AdSense ads on Blogger mobile (if you haven't already done so). Displaying ads in mobile version of your blogger blog will help capitalize on all the mobile traffic and increase earnings. Monetizing mobile version of your blogs requires some understanding and use of certain responsive web design techniques. However, enabling ads is easy. So this tutorial is for those of our readers who have asked similar questions. Note: Sign Up for a new AdSense account if you don't have any, or just log in. Remember that if your AdSense account is disabled (as is the case with many bloggers), you can click on the 'Switch AdSense' button and setup a new account or login with a different one. A ban on an account doesn't necessarily mean a ban on the site. Set 'Show Ads on blog' to Yes, and in the 'Display' drop-down, select an area you want to show AdSense ads in, for example '"sidebar and posts"
Save settings, and be done! Once you're done, the ads will start showing up automatically. Most bloggers simply insert the ad code in Blogger to show ads, But with this approach, you can easily show AdSense ads from any account, and this will automatically insert the ads within the desktop and mobile versions of Blogger.